This is a perfect gift for Easter! It contains six of our exquisitely hand dipped fortune cookies gently nestled inside our assorted translucent pastel Take Out Pails (Take Out Pail colors may vary). Traditional messages of good fortune are nestled inside each cookie. 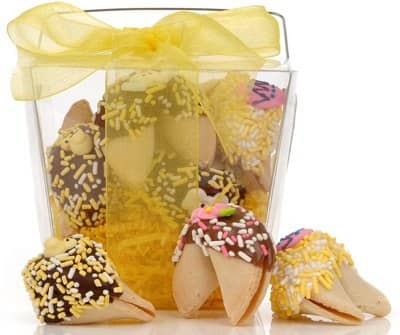 Each crisp vanilla fortune cookie is dipped in your choice of Dark, Milk, White Belgian Chocolate or Golden Caramel. Our Confectionery Artisans decorate them with 100% handmade Royal Icing Easter Decorations then sprinkle with pastel Candy Confetti. Each cookie is individually wrapped in its own cellophane bag and heat sealed at both ends for freshness. A signature Gold Label graces each Take Out Pail and a beautiful ribbon accentuates the presentation. This Gift of Fortune is a perfect way to celebrate the Easter Holiday!